Leo Jones & Son, Inc. Here at Leo Jones & Son, we are committed to providing the highest quality service to every customer. We've been providing hometown quality service since 1945. Take advantage of manufacturer promotions and rebates or special discounts for service or tune-ups. When you hire Leo Jones & Son for your heating and cooling service or installation, you’ll be working with a smart, dedicated team of professionals who offer creative solutions to your HVAC challenges. Our goal is to always provide more value than what you’re expecting. With over 70 years of experience in Laurel County in both residential and commercial designs, we have performed applications for an array of satisfied and grateful clients. At Leo Jones &amp; Son, quality is a prerequisite, not an option! With the Trane ComfortLink™ II control and Nexia™ Home Intelligence, you can manage your home’s comfort and efficiency, whether you’re sitting on your sofa or a beach chair 3,000 miles from home. Advanced climate control capabilities let you adjust temperature settings from anywhere. 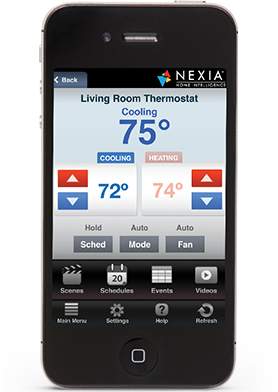 And Nexia automation can make your whole house behave the way you want it to – control locks, lights, cameras and more, remotely, through both web and smartphone interfaces. We offer residential and commercial preventive maintenance agreements for businesses of any size. By becoming a Preventive Maintenance Agreement (PMA) customer you will be placed on a maintenance schedule in our computer systems. You may choose an annual service, a semi-annual service, or more frequent services throughout the year. We will call you to let you know when it is time to service your heating and cooling system. You will not have to worry about a thing, we will take care of everything. You will be entitled to a 10% discount on services, including parts and labor. You will also receive the same low rate for services conducted after hours, on weekends, and holidays. Since 1945, Leo Jones & Son has been the name you can trust for everything related to heating and air conditioning in your home or office. While there are dozens of other companies that can provide heating and air conditioning, service and installation, here are a few reasons why you should choose Leo Jones & Son. As a charter member of the Trane Comfort Specialist™ program, we continue to meet Trane’s strongest standards for professionalism and technological expertise. Our technicians and staff are required to participate in ongoing training to help them be the best they can be in our industry. We work hard to exceed our customers' expectations, and have served thousands of residential and commercial customers for over 70 years. Subscribe to our newsletter for monthly updates, articles and HVAC tips, directly in your inbox.